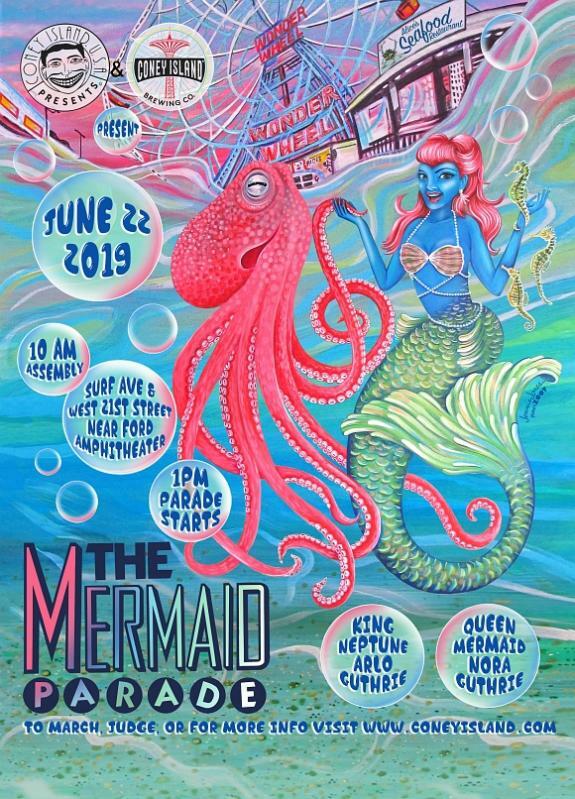 King Neptune Arlo Guthrie and Mermaid Queen Nora Guthrie! Born in Coney Island, the Guthrie kids will be heading back home to where it all began to celebrate the opening of Coney Island Beach for the 2019 season! March 13th marks the anniversary of the passing of Marjorie Guthrie, Woody Guthrie's wife. 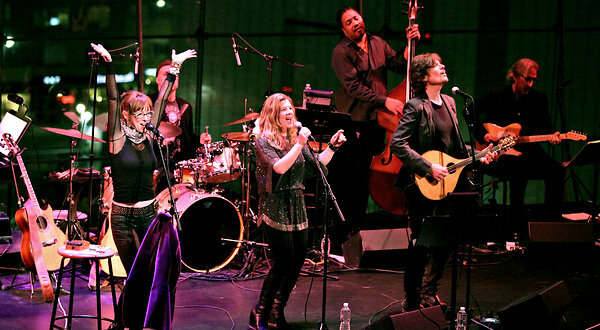 Announcing "Woody Guthrie All Star Tribute Concert 1970"
COMING SOON! New release for Record Store Day ~ April 13, 2019! What do Woody Guthrie, Jeff Tweedy, Ryan Harvey, Johnny Irion, Ani DiFranco, Tom Morello and Trump have in common? Nora Guthrie collaborated with Omnivore Records on this timely release - 4 song, 10" vinyl. "Mapping Woody Guthrie" traces Guthrie's ramblings from California to the New York Island. University of Oklahoma Press, January 2019. Available here. A NOTE FROM NORA GUTHRIE ~ It's fascinating to watch how "This Land is Your Land" has sparked artists to speak out on all fronts. For decades now, it has flowed through the veins of American battles for social, economic and political justice. Sometimes it is like a hymn, or a prayer. Sometimes like an anthem. And sometimes like a battle cry. But no matter what the tone, taking a line from Woody's song "Tom Joad" the song belongs "wherever people are fighting for their rights, that's where I'm gonna be." 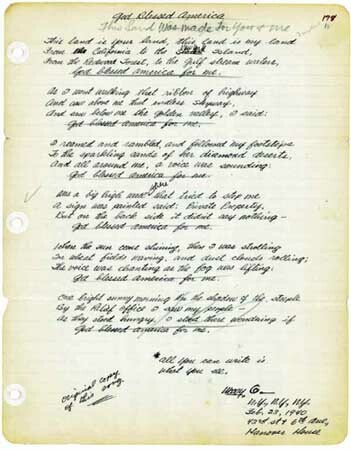 Original handwritten version of "This Land Is Your Land" by Woody Guthrie. "THE FOLKIE AND THE YIDDISHIST COULD BE FRIENDS - Nora talks about her father and her Jewish roots"
Special release on February 23, 2015, to mark the 75th Anniversary of Woody Guthrie's "This Land Is Your Land". 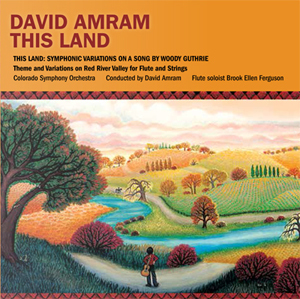 Composed & conducted by the accomplished, David Amram, and commissioned by the Guthrie Family. Click here for additional information. Author, PHILLIP BUEHLER and Woody Guthrie's daughter, NORA GUTHRIE, will share photographs, films, and stories that focus on Woody Guthrie’s years as a patient with Huntington’s disease at the Greystone Park State Hospital in Morristown, NJ from 1956-1961. Phillip Buehler, a photographer who has captured many images of the site over the past decade, fears that tearing down the building will make it harder to preserve the history of the institution. 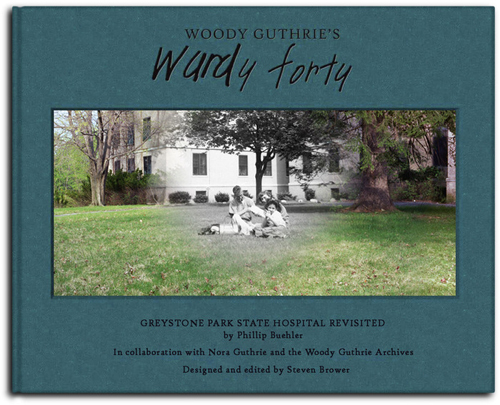 Mr. Buehler is the author of a book, "Woody Guthrie's Wardy Forty: Greystone Park State Hospital Revisited," which chronicles the singer-songwriter's stay at the hospital between 1956 and 1961. "I realize it's a monumental undertaking to save it, but can you imagine not having Ellis Island or the High Line as they are preserved today?" noted Mr. Buehler. July 4, 2012 - Google remembers Woody's "This Land Is Your Land" with a Google Doodle! These special performances will be recorded for a Master Recording Release by the internationally renowned Colorado Symphony Orchestra! 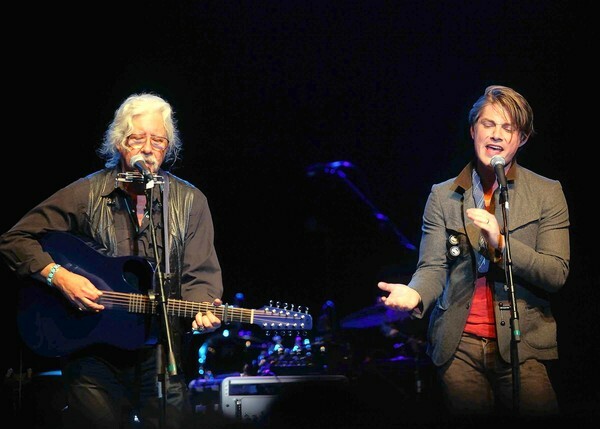 If you'd ever wondered what might induce Tom Morello and Van Dyke Parks to get together, you got your answer last night at Club Nokia in Los Angeles, where rockers and folkies of varying ages and inclinations gathered to pay tribute to Woody Guthrie. The roots-music legend, who died in 1967, would have turned 100 this year, and last night's all-star concert capped a week of commemorative activity at L.A.'s Grammy Museum, including lectures, film screenings and a performance by Guthrie's son Arlo. 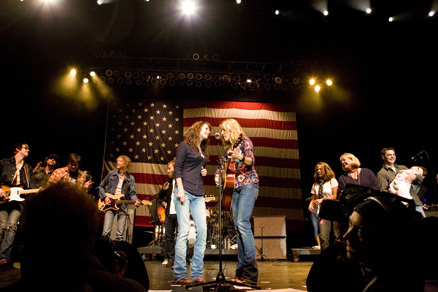 Morello appeared halfway through the three-and-a-half hour show, first pairing Guthrie's "Tom Joad" with "The Ghost of Tom Joad" by Bruce Springsteen (whom the Rage Against the Machine guitarist called "the only Boss worth listening to"); then Morello invited Parks, Jackson Browne, Graham Nash and the members of Dawes onstage for "Ease My Revolutionary Mind," from last year's Note of Hope: A Celebration of Woody Guthrie. A lullaby, you might not be surprised to hear, it was not. Where's Woody when we need him? 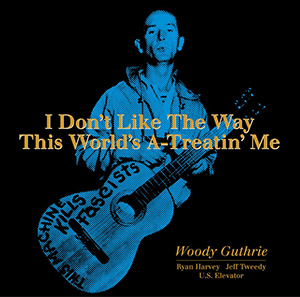 This year marks the 100th anniversary of the birth of Woody Guthrie, and in these hard times of tinkle-down economics, we sure could use some of his hard-hitting musical stories and inspired lyrical populism. He wouldn't need to write any new material. Just as in his day, our Wall Street banksters are getting rich, even as the victims of their narcissistic greed get pink slips and eviction notices. Bruce Springsteen and the E Street Band close their SXSW set with "This Land Is Your Land" and some friends; Tom Morello, Alejandro Escovedo, Eric Burdon, Arcade Fire's Regine Chassagne and Win & Will Butler. Watch the video: Bruce Springsteen and the E Street Band - "This Land Is Your Land" (Woody Guthrie cover) from Consequence of Sound on Vimeo. Springsteen conceded that he had no interest in becoming a resurrection of Woody Guthrie, who never had a hit record or a platinum disc. "I liked the luxuries and comforts of being a star," he told the capacity crowd in the Convention Center ballroom. But after reading Joe Klein's "Woody Guthrie: A Life" in his early 30s, the Boss felt he'd obtained a strategy for shaping the form he loved -- pop music -- into something that could address grown-up problems. According to Springsteen, he'd first fallen for the stories -- and the hard stoicism -- of country music. But even as he was attracted to the fatalism of country artists like Hank Williams and Jerry Lee Lewis, he found something toxic about those singers' resignation to cruel fate. The Boss wanted an answer to the implicit question posed in Williams' "My Bucket's Got a Hole in It": why, he wondered, were hard times permanent for working men and women? In Guthrie's work, he found a way forward: "fatalism tempered by a practical idealism," and a conviction that "speaking truth to power wasn't futile." “I never dread the day that I will die/Because my sunset is somebody's morning sky,” Woody Guthrie wrote in his journal on April 17, 1942. More than six decades later those words became the bridge in “My Battle,” an unpublished Guthrie lyric set to music by the folk-rock singer-songwriter Jonatha Brooke and recorded on her 2008 album, “The Works.” That record was the focus of Ms. Brooke's 90-minute Lincoln Center American Songbook show, in celebration of Guthrie's centennial, in the Allen Room on Wednesday night. The Grammy Museum plans 'Woody at 100' events to honor what would have been Woody Guthrie's milestone birthday. His music speaks to the Occupy protesters of today. Legendary folk musician Woody Guthrie would have turned 100 years old in 2012, and to honor his memory The Grammy Museum is teaming up with both the Guthrie family and The Woody Guthrie Archives to host a number of Centennial celebration events spread across the year. One of these celebrations is a collaborative tribute album, which was recorded by a quartet of great musicians: Will Johnson of Centro-Matic, Jay Farrar of Son Volt, Anders Parker of Varnaline, and Jim James from My Morning Jacket (who went by his pseudonym Yim Yames for this project). John McKutcheon celebrates Woody Guthrie Centennial with new album. Nora Guthrie shares her reflections of her famous father in this interview recorded Oct. 7, 2010. Back in 1941, famed folk singer Woody Guthrie lived in Portland for about a month, but he generated some of his most memorable songs, including "Roll on, Columbia." 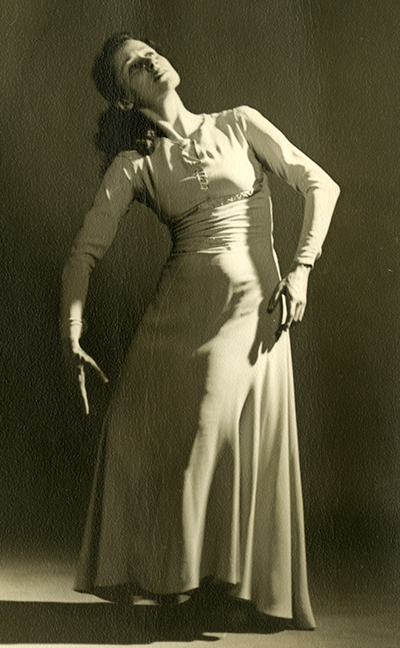 Later this month, 70 years later, a documentary film about Guthrie's time in Oregon will be brought to the big screen. "Roll on Columbia: Woody Guthrie and the Columbia River Songs" will be premiered at 6:30 p.m. April 26 at the McMenamin's Edgefield Pub, 2126 S.W. Halsey St., Troutdale. Given by U.S. branch of the International Association for the Study of Popular Music. 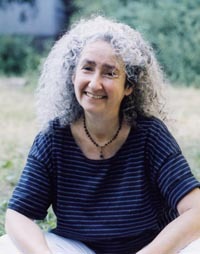 The Woody Guthrie Book Award committee, which was comprised of Anahid Kassabian (University of Liverpool), David Brackett (McGill University) and David Shumway (Carnegie Mellon University), considered 22 books for the award that recognizes the most distinguished English language monograph in popular music studies published during 2009. 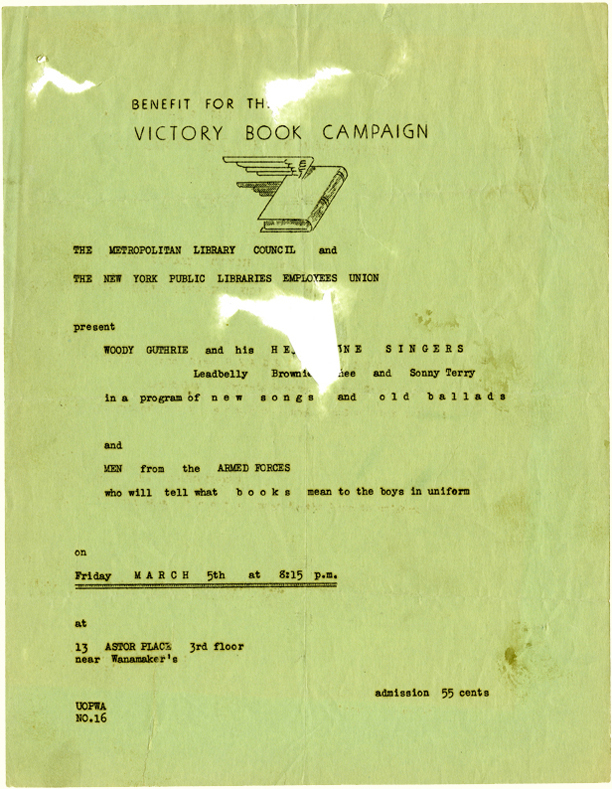 Check out this flyer announcing a show that Woody Guthrie & His Headline Singers (Leadbelly, Brownie McGhee and Sonny Terry) performed for the New York Public Libraries Employees Union in 1943. 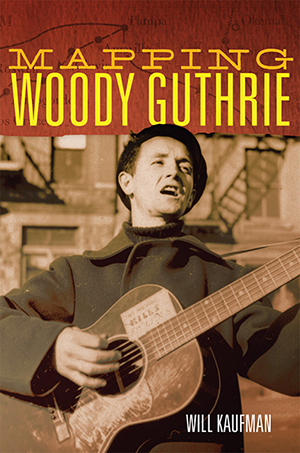 The first and only known documented performance from Woody Guthrie & His Headline Singers. March 5, 1943. 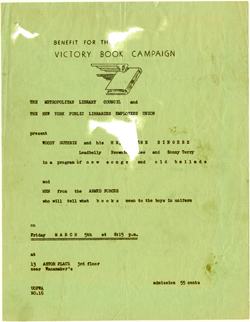 Concert Programs. 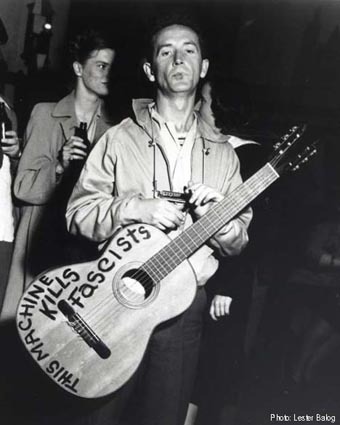 Courtesy of the Woody Guthrie Archives. Wisconsin Librarians March to the beat of "This Land Is Your Land"
A third librarians' march took place on March 12 during what has been a month of daily protests at Wisconsin's State Capitol. Library staff and supporters gathered at Madison Public Library's Central Library and marched to Capitol Square singing Woody Guthrie's "This Land Is Your Land," followed by chants of "Librarians! United! Will never be divided!" "The Life, Music and Thought of Woody Guthrie: A Critical Appraisal"
Alone and feeling kinda down, while staying in a grungy New York City hotel called Hanover House, iconoclastic folksinger Woody Guthrie took a simple sheet of loose-leaf paper and uneventfully wrote down words that have grown into some of the most timeless lyrics ever penned about the American experience on Feb. 23, 1940. He originally called the song "God Blessed America," but quickly scratched out that title and renamed it "This Land Was Made for You & Me." At the bottom of the page, he jotted down, "all you can write is what you see," and signed it "Woody G."
February 21, 2011 - Tom Morello, Tim McIlrath, Wayne Kramer, Tom Cabel, and Mike McColgan et al. perform "This Land Is Your Land" in front of the WI State Capitol during the Rally for Wisconsin's Workers in Madison, Wis. on Feb. 21, 2011, in support of public employees whose collective bargaining rights are threatened by Wisconsin Gov. Scott Walker's proposed budget repair bill. American Icons - "This Land Is Your Land"
All of America sings it at school and summer camp; Bruce Springsteen sang it at President Obama's inauguration. Yet Woody Guthrie's song was once called anti-American, even Communist. Pete Seeger explains how Guthrie wrote it as a sarcastic response to "God Bless America"; soul singer Sharon Jones tells us what the song means to her as a descendant of slaves. 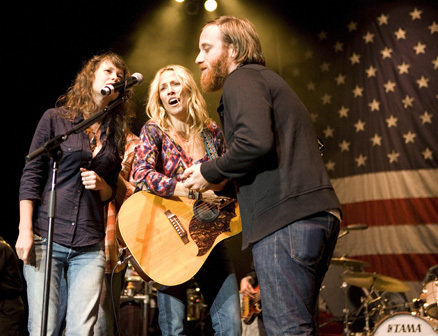 Leftist, environmentalist, nationalist, or patriotic - "This Land" allows everyone to sing it their way. 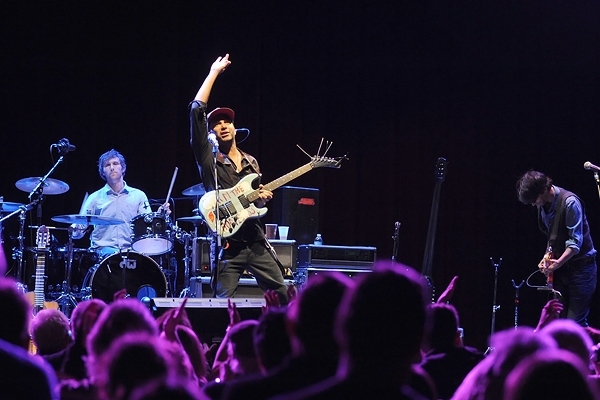 Tom Morello joins Outernational recording "Deportee" in protest of Arizona's new immigration law. This song is Glenn's song? wasted songs of a superstitious nightmare. Lonnie Donnegan Band records "Vigilante Man"
U.S. Olympics snowboards to "I'm Shipping Up To Boston"
"I'm Shipping Up to Boston" has clearly been one of the vehicles that has increased the Murphys' exposure over the past five years. The song is a constant presence at the Boston Garden, it was a huge part of the Red Sox championship season (pitcher Jonathan Papelbon took the mound with "I'm Shipping Up to Boston" as his soundtrack; he and the Murphys performed it on a float in the championship parade), and it was recently certified platinum. "If you'd asked me five years ago, 'Do you think you'll ever have anything gold or platinum?,' I would have said, 'Aside from something in my mouth, no,'" Barr says with a laugh. "Then to have Seth Westcott snowboard to us and one of the U.S. ski team skiing to us. There's always some new thing happening with that song. It's crazy." HBO special "The People Speak"
An HBO documentary, "The People Speak" inspired by Howard Zinn's books, "A People's History" and "Voices of a People's History", features two Woody Guthrie songs; Do Re Mi performed by Bob Dylan, Van Dyke Parks and Ry Cooder and This Land Is Your Land performed by Bruce Springsteen. Six-time Academy Award nominated film, Up In The Air, opens with a funky, contemporary cover of Woody Guthrie's working-class American classic "This Land Is Your Land" by Sharon Jones and the Dap-Kings, setting the story into motion. Says director, Jason Reitman, "It's a really lovely soulful entrance to the journey of this film about the American landscape." Michael Moore film- "Capitalism A Love Story"
Michael Moore's new film: Capitalism: A Love Story, features Merle Haggard singing Woody's classic, Jesus Christ. Watch the trailer. After an amazing discovery in a New York basement, lost Woody Guthrie masters are being released...Read more and see the video at the Channel 4 website. "Woody Guthrie's Mystery Masters. A trove of newly discovered recordings brings new focus to the iconic troubadour's legacy..." read the full article here. The NYC400 is the first-ever list of New York City's ultimate movers and shakers since the City's founding-from politics, the arts, business, sports, science, and entertainment...More Info here. 6,000 People Play "This Land Is Your Land" at Red Rock, Colorado. World's Largest Music Lesson at Red Rocks. Swallow Hill Music Association, Denver Film Society and Red Rocks host an audience of 6,607, breaking the Guinness World Record for the largest music lesson. Red Rocks Amphitheater, Morrison, Colorado, USA. Audio from the event can be heard here. Lonni Donegan - "Grand Coulee Dam"
Skiffle King Lonnie Donegan and his group in 1957, playing Woody Guthrie's song Grand Coulee Dam. A song Woody Guthrie wrote in response to Irving Berlin's more commercially patriotic "God Bless America," has been voted the number one essential folk song by 3,200 listeners to FolkAlley.com. On a rain-soaked night, more than 15,000 people turned out at Madison Square Garden to salute the man who wrote or co-wrote some of the most influential political anthems of the last 60 years, including "If I Had a Hammer," "Where Have All the Flowers Gone," and "Turn, Turn, Turn (To Everything There is a Season)." 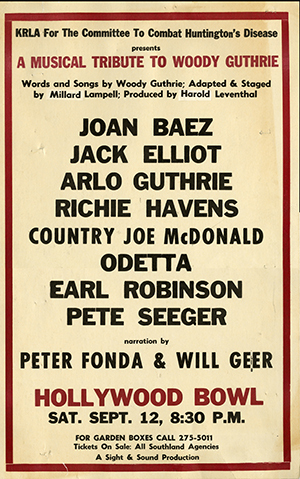 The roster of A-list performers -- including Bruce Springsteen, Dave Matthews, Arlo Guthrie, Emmylou Harris, John Mellencamp, Kris Kristofferson, Joan Baez and others -- also included appearances by Tim Robbins, Norman Lear and Ruby Dee, and a happy birthday message to Seeger from President Obama. THIS LAND IS YOUR LAND at the We Are One Obama Inauguration Celebration! "At the conclusion of today's concert for President-elect Barack Obama, 89-year-old Pete Seeger joined Bruce Springsteen for a sing-along with perhaps half a million people of Woody Guthrie's 'This Land Is Your Land,' which I dare say practically everyone in the country knows from childhood. But sly old Pete, who actually hoboed with Woody during the Depression and Dust Bowl, had the crowd sing the song as it was actually written, as not only a celebration of this great land, but as a demand for workers' and people's rights." - See Jonatha on tour! Photographs and copyright Stephanie Scott Images. "Variations on a Song by Woody Guthrie"
LISTEN to Variations on a Song by Woody Guthrie! David Amram premiered his new orchestral suite Variations on a Song by Woody Guthrie with the Symphony Silicon Valley Orchestra with two performances on September 29th and October 1st . Conducted by Paul Polivnick, the premier celebrated the opening of the orchestra's new season and took place at the beautifully restored historic California Theater in downtown San Jose. The theater was packed! The symphony is currently being scheduled for performances with numerous orchestras throughout the country as well as a studio recording. We'll keep you posted! 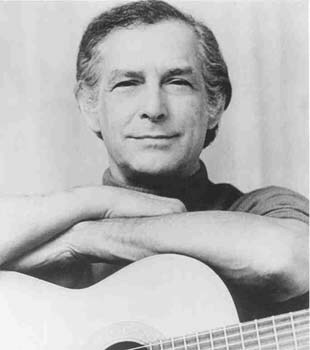 - LISTEN to Variations on a Song by Woody Guthrie! M.I.A. 's "Paper Planes" deftly connects Woody Guthrie's "Deportee"and influence with M.I.A. 's hit single. World renowned geneticist Michael Hayden named Canada's "researcher of the year". A close friend and colleague of Marjorie Guthrie's in Huntington's Disease research. BIG NEWS from the Huntington's Disease Community! We are pleased to announce today that Xenazine (tetrabenazine) the first and only FDA approved drug for the treatment of chorea associated with HD is now available in the U.S. This is truly a milestone to be celebrated and we are so pleased to share this news with you. For more information please click here.